ST. LOUIS, mo. — Hundreds of motorcycles flooded the streets of St. Louis last weekend for the annual Ride of the Century. The groups' antics, particularly beneath one of the city's most prized attractions, have many residents and visitors frustrated over what they are calling blatant disrespect, according to KTVI. Riders from all over the country showed up for the event. KTVI received numerous complaints and there are countless posts on social media claiming riders harassed people near Busch Stadium and Ballpark Village, popped wheelies on the highway, and performed other dangerous maneuvers in traffic. Several people reported damage to their vehicles caused by careless motorcyclists. A video of motorcycles doing doughnuts and other stunts on the grounds beneath the Gateway Arch has gotten a lot of negative attention. Bret Rich, who posted the video, said he was enjoying the evening at the Gateway Arch National park with his family when he heard the hum of motorcycles approaching. Rich said before he knew it, nearly a dozen motorcycles swarmed the park. Rich estimates there were about one hundred people spread across the grounds of the park which re-opened in July after a $380 million renovation project. "How incredibly disrespectful that was," said Rich. "This city’s gone through a lot to have the Arch renovated and to cover Highway 70 to make the Arch more accessible to the city, and a lot of people are very happy about that." 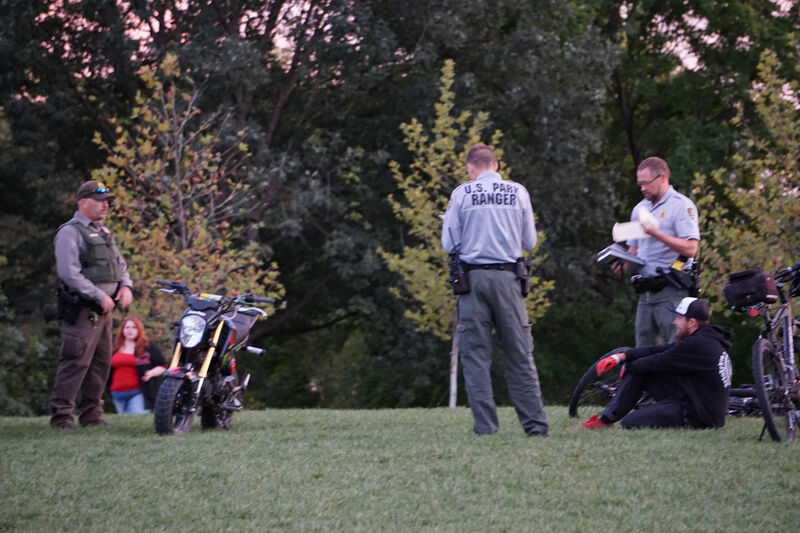 According to park rangers, three men were detained and cited in this incident. The U.S. Attorney issued federal citations for Felix Torres, 23, of Texas, Dale Kiesgen, 32, of Illinois and Matthew Parisi, 20, of Ohio. The citations are for "operating a vehicle off a roadway." Their motorcycles were also impounded. Deputy Superintendent of the Gateway Arch National Park, Frank Mares said, fortunately, the damage to the grass around the Arch was minimal. Also Saturday night, St. Louis police towed nine motorcycles and issued 15 tickets for excessive noise, no state vehicle license, and obstructed/improperly affixed state vehicle license plates.